You can send and get fax messages over Internet easily by using Internet fax service. You just subscribe to an online fax service. You will also be provided with the facility of slashed rates and many other such advantages. Once you subscribe to any such service you can send and get instant fax messages from all over the world. There is no time restriction. The only prerequisites are a computer with an Internet connection and an e-mail ID. A variety of online fax services are available on the Internet. These companies offer free as well as paid services for their customers. The free services are also worth it. But if you want to avail the full benefits of an online fax service you ought to go in for a paid service. While using free service you are entitled to sending and receiving a limited number of fax messages only. No other advantage is offered to you. As far as its usage is concerned, it is quite an easy task. It is similar to sending and receiving e-mails in many respects. The first step as mentioned above is to avail the subscription of an online fax service. Then you are given an exclusive Internet fax Id. It is very similar to your email Id. It is our Internet address at which other people will send their fax message to you. You will also be asked to create your own new Id in that domain in which the service has been placed by the service provider. Then you will be ready for sending and receiving emails. Actually, it is the space in the cyberspace where you will type your fax messages. It is also the place where the fax messages from different persons will be parked. 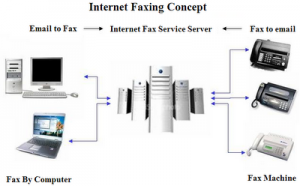 Once you send your fax message, it goes to the server of the service provider. There its format is changed so that it attains a suitable file format. It is in this format that your message is sent to the desired recipient. The message may go into the recipient’s mail or directly to the fax machine. A major advantage of using online fax service is that you are able to send messages instantly to any part of the world. There is also no limitation as to what number of messages you want to send at a particular instant of time. Moreover the conventional method of sending fax is quite cumbersome and is also prone to paper jams and other related problems. This service is even cheaper that the conventional fax service. So, you get the added advantage of speed as well as economy by subscribing to an online fax service. Don’t forget to do required research so that you are able to save your hard-earned money by striking the right bargain.